IT Platform for Innovative Smart Energy Services. The technical platform Green IT Homes opens new business opportunities in the energy market. It creates unique communication paths between the customer and the utility company, improves the relationship and service, and enables the development of smart energy services. 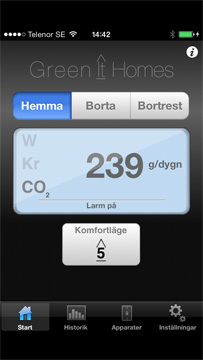 House-owners can for example control their home from their mobile device with Green IT Homes. 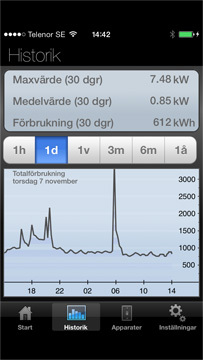 Electricity and energy consumption is clearly visualised and the house’s environmental impact is shown in relation to indicators such as life quality and costs. 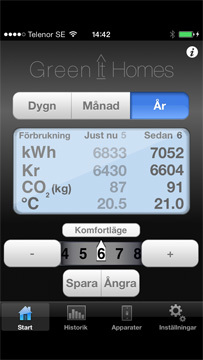 Green IT Homes enables energy companies to create individual digital solutions. It is possible to add and modify user features, graphic expressions and customise names. We created the platform based on user trials with end users, in collaboration with the Interactive Institute. Want to know more about Green IT Homes?